Opening Nights at Florida State University has announced its 2018-2019 season of performances and events. The lineup boasts 45 performances with artists from 11 different countries representing music, dance, theatre, comedy, spoken word and visual arts. Emerging artists, such as classical performing artist and accordion prodigy Hanzhi Wang and popular favorites like The Temptations and the Four Tops, will perform in the Capital City. Season features include: Comedian Brian Regan (Oct. 1); “1964” The Tribute, a reflection in the shift of popular music created by the British invasion (Oct. 4); Soweto Gospel Choir, South Africa (Dec. 11); Bela Fleck and Abigail Washburn (Jan. 14); Joshua Bell (Jan. 28); The Boston Pops on Tour (Feb. 14); Jimmy Webb (March 26); and Rosanne Cash (April 27). There will be two family-friendly matinees with all seats available for $10. Parsons Dance Company (Jan. 12) will present a “sensory friendly performance.” A Parsons Dance representative will navigate the audience through the performance, pausing between each piece to tell the audience what to look for and to answer questions. On Feb. 2, Cashore Marionettes will perform “Simple Gifts,” a humorous and entertaining show that redefines the art of puppetry. In addition to the traditional FSU venues, Opening Nights will host several performances throughout the community to reach a broader audience. The Young Concert Artists series, featuring Hanzhi Wang (Oct. 17) and flutist Anthony Trionfo (Nov. 15), will be held at St. John’s Episcopal Church. Late Night Tailgate (Oct. 13) will be held at The Moon. The Prague Philharmonic Children’s Choir (Oct. 18) will perform at St. Peter’s Anglican Church. Opening Nights will return to FSU Panama City for a holiday performance featuring The Barefoot Movement (Dec. 12). Two performances of the Cashore Marionettes (Feb. 1-2) will be held at Tallahassee Community College’s Fred Turner Auditorium. Temple Israel will host cellist Matt Haimovitz’s performance, “The Bach Suites: A Moveable Feast,” on March 31, Bach’s birthday. Several bluegrass artists will perform at Goodwood Museum and Gardens throughout the season, and Pebble Hill Plantation will host Tom Rush in February. For the full season lineup and ticket information, visit OpeningNights.fsu.edu. 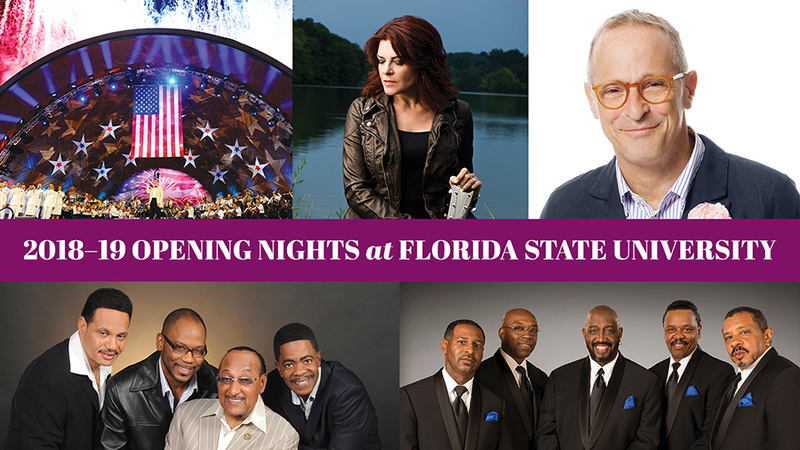 Opening Nights is Florida State University’s official performing arts presenter, bringing world-class talent to campus and the capital region. For more information, visit OpeningNights.fsu.edu.